Nerial undoubtedly has another hit on its hands with Reigns: Her Majesty. The iOS game, which is published by Devolver Digital, will be familiar to anyone who played its forerunner, Reigns. The game mechanics and art style are largely the same, but there’s greater depth and nuance to Her Majesty, which takes it beyond a dull retread of a hit formula. This time, you play as the queen making decisions that affect the longevity of your reign. 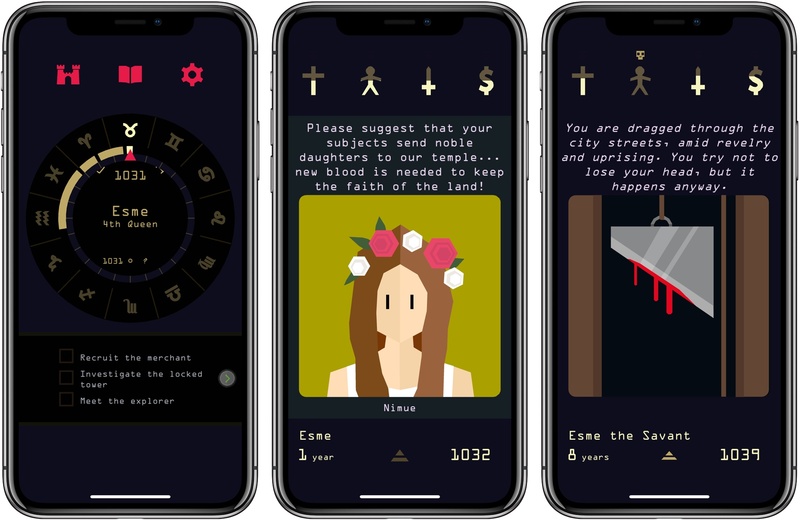 As with Reigns, Her Majesty is a card-based game that leads you through a complex narrative where you have to make decisions at every turn by swiping cards left or right off the stack that is dealt at the outset of the game. The consequences of those decisions are tracked by four icons at the top of the screen that monitor the strength of the church, your subjects, the army, and your finances. Each choice you make causes the meters in those icons to fill or drain. Once an icon is fully drained, your monarchy ends in a horrible death at the hands of the group you’ve alienated. As one reign ends though, you return as a new queen to see if you can hold onto power longer and progress through more of the story. The writing is excellent, which is key because Her Majesty is primarily a text-driven adventure. Text-based games often get tiresome, but Her Majesty strikes an excellent balance between brevity and storytelling. There’s also something amusing about deciding the fate of your subjects with a quick flick of your thumb that adds levity to the grim fate that inevitably awaits you. Her Majesty is a deeper game than the original. The game benefits from many more cards than Reigns had, which means less repetition. The relationships between the characters of the game are more important than in Reigns too. In the original game, there was more emphasis on managing the ‘business’ of running your kingdom. Here, there is jealousy, infighting, and intrigue among the characters, which I found told a more interesting story. The combination results in a more engaging tale that has kept me coming back to Her Majesty over and over. There is more to Her Majesty than just working your way through a complex decision tree though. At the beginning of each reign, you are presented with a series of challenges, which helps provide focus and structure around your decision-making. Completing challenges unlocks additional card sets, which adds variety every time you play. Also, there are objects to be found and collected in your inventory. Each can be played in the game when you encounter certain characters, which has an impact on the outcome of your story. Everything is neatly tied together by a wonderful soundtrack from Jim Guthrie who also did the music for the hit indie game Sword & Sworcery. It’s not something I noticed at first, but the soundtrack goes a long way towards setting Her Majesty apart from Reigns. As with so many other successful mobile games, Her Majesty is a careful balance of simple user interaction – it doesn’t get much simpler than swiping left and right – and complexity. Here, Her Majesty’s simple mechanics hide a rich, nuanced story that is difficult to successfully navigate. Her Majesty is designed to be easy to play in short sessions when you find yourself with a free moment, but it’s the narrative, and the challenge of seeing how long you can rule, that will bring you back to the game over and over. I highly recommend trying Reigns: Her Majesty. It’s an excellent choice for when you find yourself with a little spare time over the holidays. And if you haven’t played Reigns yet, which I reviewed last year and was one of our favorite games of 2016, you should check that out too. 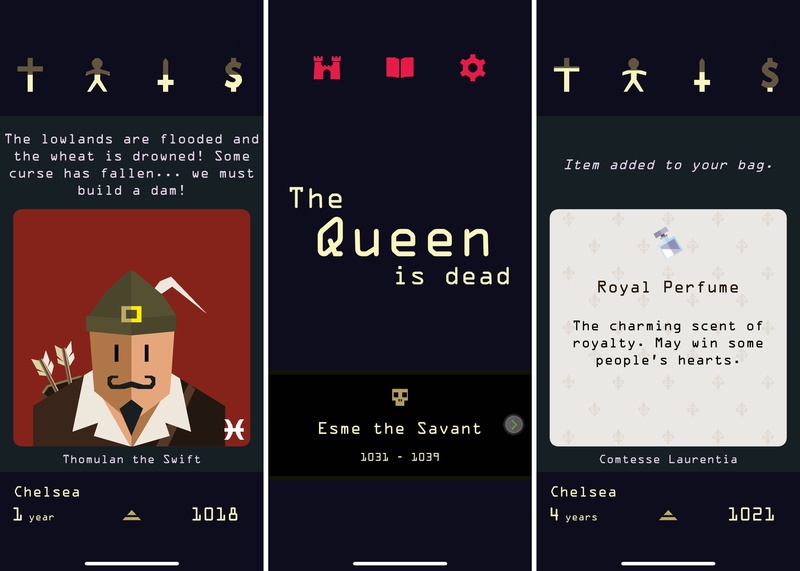 Reigns: Her Majesty is available on iOS from the App Store and for the Mac on the Mac App Store and Steam.